What is Scrumpy & Western music? 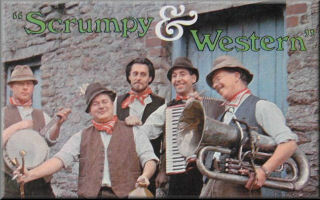 Scrumpy & Western music is the music of the West Country of England. It is best known as being the music of Adge Cutler and the Wurzels, but to connoisseurs of the genre there is much, much more to Scrumpy & Western music than just Drink Up Thy Cider or Combine Harvester. This website lists well over 30 artists and bands whose music falls into the genre, and there are undoubtedly many others not listed, and more yet who have Scrumpy & Western songs within their repertoire, but whose music fall mostly into other genres. Scrumpy & Western. Also see Scrumpy and Western, Scrumpy ‘n’ Western. n. A type of music mostly restricted to the West Country of England, consisting of upbeat, optimistic rustic songs often accompanied by banjo, accordion and tuba. The term "Scrumpy & Western" is, of course, a parody of the equally rural but hardly upbeat and optimistic Country & Western music genre; although the genres are poles apart. With jazz and folk music purists both distancing themselves from his brand of music, Adge Cutler used the phrase "Scrumpy & Western" when asked to describe what kind of music he wrote. He described his songs as the kind of music that his West Country fans enjoying listening to while supping their scrumpy. This underlines Adge’s rather wicked sense of humour and subtly sophisticated wit; while deliberately understating his music, the name manages to appeal to people on different levels – rather like his songs do. Exact styles vary by band or musician, and very few are known outside the West Country. The main exceptions to this are Addge Cutler & The Wurzels, who had a number one hit in the UK with Combine Harvester in 1976 followed by several other hit singles. This followed an earlier hit single with Drink Up Thy Zider, an unofficial West Country anthem, especially among supporters of Bristol City FC. This gained notoriety when the BBC refused to play its B-side song, Twice Daily, due to concern about the unseemly subject matter (a shotgun wedding). Combine Harvester itself was a re-worded version of Melanie's hit single Brand New Key and other songs borrowed the style and made fun of British popular music genres. To say that Adge invented Scrumpy & Western music though would be to do a disservice to those singers and songwriters who were producing and performing songs of a similar ilk before him; people like Len ‘Uke’ Thomas, who Adge openly acknowledges on his first album. Adge did not invent Scrumpy & Western music; he merely labelled it - and this website aims to be an archive of the whole of the Scrumpy & Western canon. There is more to Scrumpy & Western music than being born, bought up or living in the South West. For this reason we are unable to include such musical dignitaries at Matt and Luke Goss from Bros who lived and grew up in Cheddar, Peter Hammill from 70s prog rock cult heroes Van Der Graaf Generator, who lives in the Limpley Stoke Valley near Bath, and rock guitarists Richie Blackmore (Deep Purple/Rainbow) and Gary Moore (Thin Lizzy) who are both Weston-super-Mare-ites. Or indeed the various other South West musicians and songwriters whose musical tasted run rather differently to the Scrumpy & Western genre. In saying that Richie will, of course, get his page if the next Blackmore's Night album has some reference to scrumpy and pasties rather than mulled cider and mead!